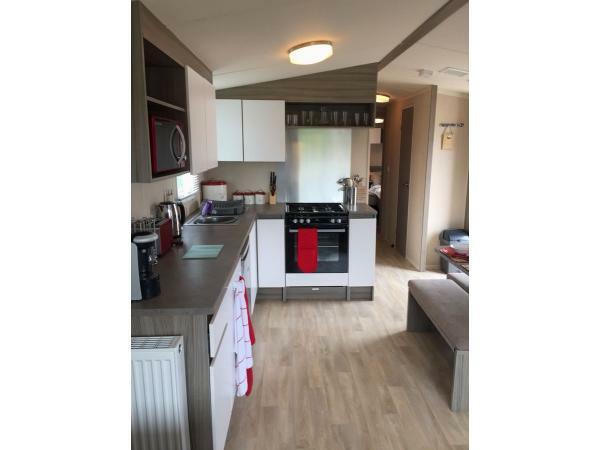 What a great caravan in a lovely location. 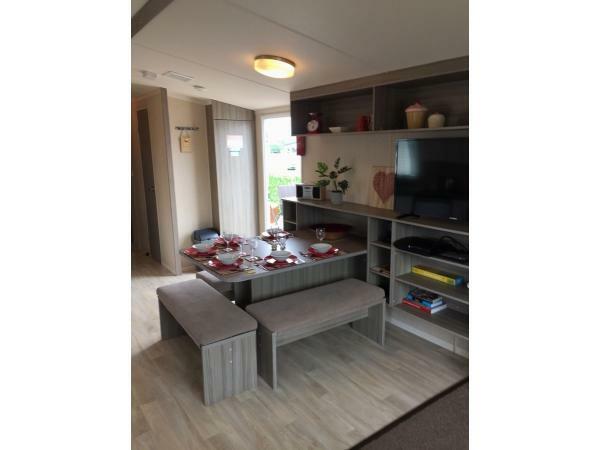 The soleil is very spacious and has fabulous decor throughout. The lounge has fixed L-Shape seating, pull out sofa bed and a contemporary electric fire with luxury carpet underfoot. Loose cushions with soft tones. A 40″ TV and central heating radiator with thermostatic valves. 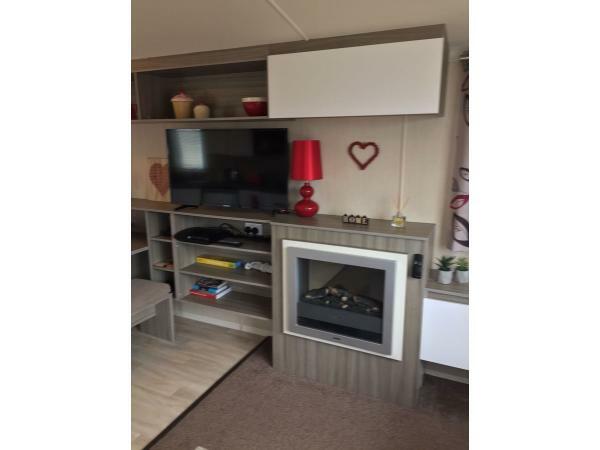 The kitchen has a fixed dinette with bench style seating, this is a fabulous place to sit and see what’s going on around the caravan. Laminate effect vinyl flooring and modern high gloss white handle-less doors. Everything for the kitchen is provided, pots, pans, cutlery, glasses etc including children’s plastic pots and plates. There is a free standing microwave, fridge with freezer compartment, cooker with grill and 4 gas rings and a lovely splash back. Tassimo coffee machine (Pods not provided). Plenty of worktop space to make that culinary masterpiece for breakfast, lunch or dinner. 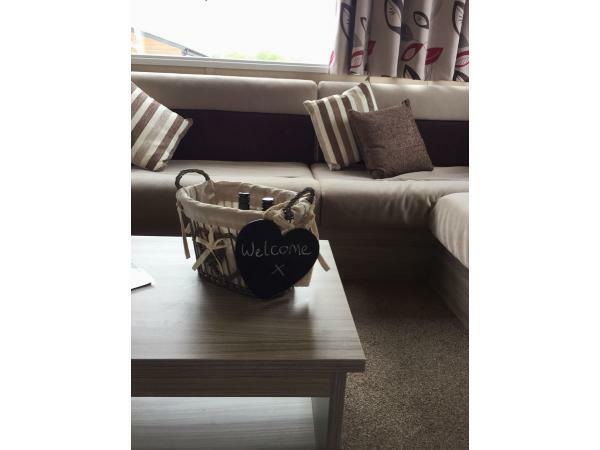 The main bedroom is very spacious it has a double bed, with wooden headboard complimented with beautiful bedding. 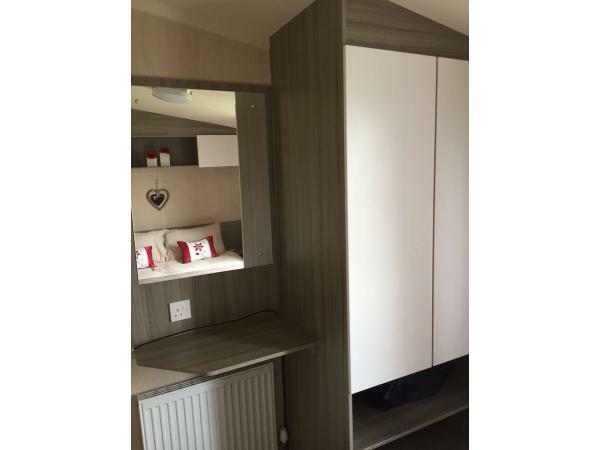 Overhead storage and bedside cabinets, double wardrobe, vanity table with mirror, power sockets and central heating radiator plus 19″ TV. 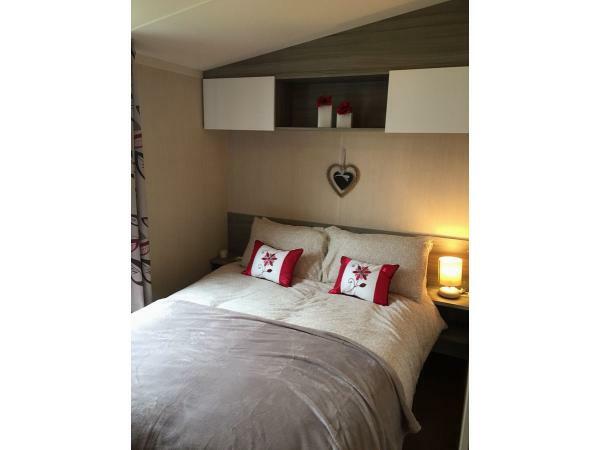 Bedroom 2 & 3 have two single beds and complimentary bedding with power socket, single wardrobe. A mirror for doing hair and makeup plus a central heated radiator. The bathroom has a shower cubicle with thermostatic shower, pedestal wash basin and W.C, towel radiator and mirrored cabinet. Please feel free to use the board games and toys. Playstation 3 is provided and a few games (please feel free to bring your own) Please put these back after use please. 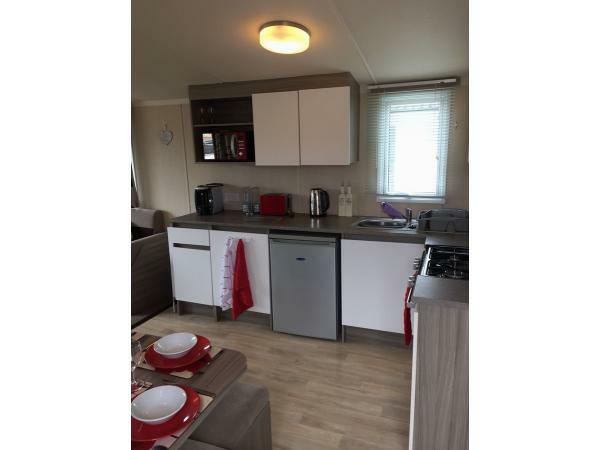 Provided is a bike rack to hold four bikes which is sited at the rear of the caravan. A travel cot is provided for you to use which is situated under the single bed in Bedroom 3 (please bring your own blankets). 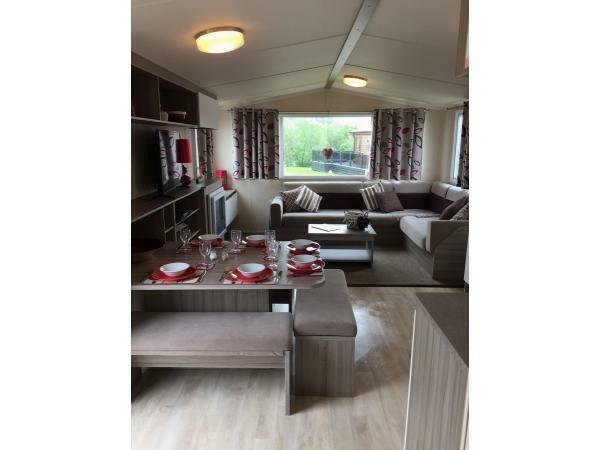 The sun sets right in front of this caravan ensuring the veranda has sun all afternoon, just sit back and relax in the luxurious hot tub or sit at the patio table with parasol. Please ensure that the hot tub cover is put on after use. Also, ensure that you read the guidelines for using the hot tub as these are there for your safety and others. Please be aware that we do not include entertainment passes. These can be purchased from the main away resorts reception. If you purchase a midweek break between October and March entertainment passes are included.